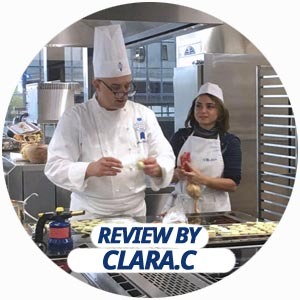 To bring this luxury pastry within your reach, Le Cordon Bleu Paris invites you to take part in a three hour macaron workshop in its brand new premises overlooking the Seine. This is the perfect setting in which to try making one of France’s most popular pastries. You will be immersed in the world of macarons; by the end of the workshop, the technique for making them will no longer hold any secrets for you. To achieve this, the participants are guided by, and receive invaluable step-by-step advice from Le Cordon Bleu pastry Chefs. Flavours such as chocolate, salted butter caramel, vanilla and pistachio are programmed. To ensure that you experience a true culinary discovery during your The Secrets of Macarons Workshop, we have chosen highly experienced pastry Chefs. Macarons have a long history and originally came from Venice. The date of their arrival in France remains uncertain. However, Parisian macarons, or "gerbets" date back to the 20th century. In many French towns, specialty macarons can be found, but the most well-known, along with the Parisian macaron, is the Nancy macaron. All macarons, without exception, are made with the same ingredients, but each has a different texture: crisp, fondant, chewy, crackled, etc. The Parisian macaron is immediately identifiable thanks to its perfectly smooth and shiny shell, and tasty filling.